After waking I told Julie I had booked us in for an event. It didn't take her long to work out it was a concert playing at the O2. She sounded okay with seeing this and as you'll expect, I'm looking forward to it. What's more Londonish than seeing a band like this? But it was breakfast time and it was the first full day so I figured I'd start with my first full buffet breakfast whilst Julz had cereal. I'd better be careful though as I have recently put on one wedding band and wouldn't want to put on another! As both of us have been to London before, there wasn't a big 'to do list' so we decided to head in and check out a few odds and ends. Julz discovered that during my previous two visits I had missed the London Eye (remember, this is the guy who didn't see the Mona Lisa while in the Lourve) so we went there first. It was certainly worth the visit. For lunch we grabbed some sandwiches from Waterloo Station. Over here there are several places like Marks and Spencer, Costa and Pret a Manger which sell sandwiches but they are all really good. We headed back into the Strand and walked for a bit looking for the Twinings store and museum as Julie loves her tea. Last trip I found the Temple Church but it was closed however this time it was open so we had a look through it. We returned to the hotel where Julz had a snooze and I did some nerd stuff while I watched France play South Africa. France didn't deserve to be there as they cheated their way in, ask any Irishmen, but poor South Africa became the first host nation to not qualify for the elimination stage. Once rested and showered we headed into Westminster and then Trafalgur Square for dinner (more sandwiches) and then onto the O2. It's an impressive venue. It's an indoor arena with cafe's and bars also inside the structure. Kid Rock was the supporting act. I call it an act because he's not very good and pretends to be something worth watching. Fortunately he wasn't on for very long and the real band arrived on stage. 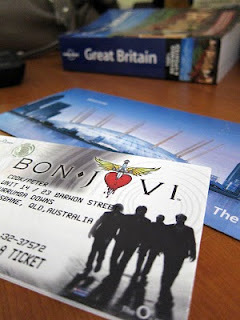 I saw Bon Jovi at the start of 2008 in Melbourne and while the play list was better then, the show they put on this time was alot better. I think Julie quite enjoyed the concert even though she was a little tired. The screens they used throughout the show were incredibly good quality to look at and moved around in different configurations across the night. Once the encore ended (which featured Always, Wanted Dead or Alive and Livin' on a Prayer) we bailed and headed home. Bon Jovi. He has brought me all the way to England to watch Bon Jovi. This will definately put me up there in the 'my wife is fantastic and willing to watch my favourite band on our honeymoon' stakes. Today I just loved walking around and reaquainting myself with my old life over here. The Eye is always a nice view and Twinings should definately export more of their tea to Australia (I have never seen so many varities!). Sarah was definately jealous when I sent her photos of us eating a Ben's Cookie and cupcakes at the Hummingbird Bakery (a 'must eat' experience for anyone visiting South Kensington). 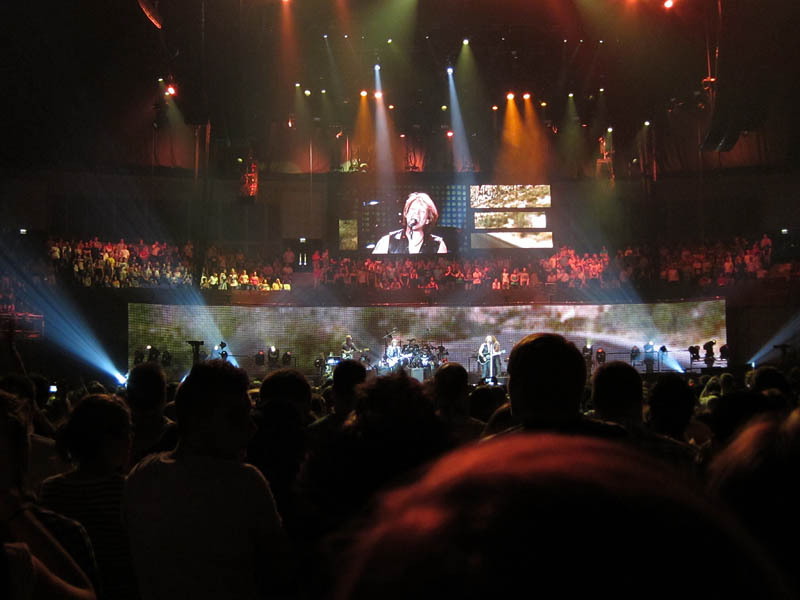 Bon jovi concert looks awesome - really jealous!! !